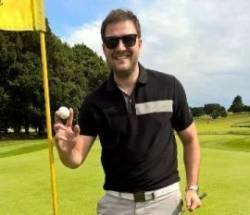 Congratulations to Gary Ray on his Hole-In-One on the 9th here at Stoneleigh. Gary teed up with a pitching wedge on the 116 yard par 3 & celebrated when his Pro V1 landed straight in the cup without bouncing! Gary and friends Lee Hopkins, Dan Doyle & Gavin Kinsella, all members at Kings Norton GC, were enjoying an 'away day' with us on Sunday & it was great to see them all.